You have found your source for the original, handcrafted Gourmet Garlic Grater from Spain. 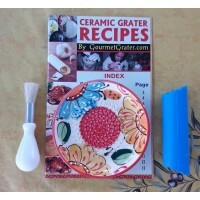 For special offers Search Gourmet Grater on Facebook!! We still love the name, La Provencale Garlic Grater, but we more often go by Gourmet Grater instead. Until all of our pictures have been updated, you can order any Garlic Grater set plus this Herb Grinder, and we will send you the Garlic Grater plate and the matching mill to correspond. Call for any questions 951 237 5560. 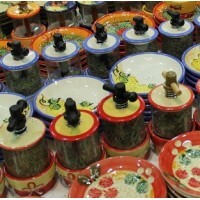 If buying just the mill, let us know what pattern to send based on name of garlic grater plates.Our wheel thrown, hand crafted, hand painted European style Dry Herb Mill will bring life to any dried herbs, spices, or seasonings. · For intense flavor, turn cross bar & finely grind herbs. Grinding the herbs re-releases their natural oils and opens up their flavor, three times as effective as rubbing dried herbs between your hands. This will make dried herbs smell and taste like fresh year round!! · Remember this will do salt and pepper, but in Europe they are popular for Dry Herbs. Push down cross bar to dispense whole Dry Herbs for more coarse texture in soups or stews, etc. Get a free sample of one of our dry seasoning blends: Herbs de Provence, Italian, or Mexican! 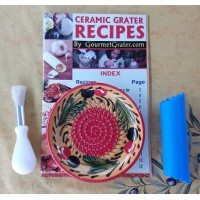 Blend with garlic paste from your Gourmet Grater! The Primo Peeler is the last peeler you will ever have to buy with our lifetime guarantee! Our patented "Grip no-slip" serrated teeth peel anything from an apple, plum, pear, peach, or kiwi all the way to butternut squash! Perfect for all the knobs and nooks on ginger, peeling around them in seconds. Comes with a free mini mandolin slicer board attachment and while supplies last a bonus Julienne tool that turns foods into stick and strips in seconds!! 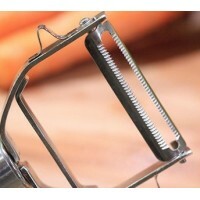 Great way to prep carrots for our Garlic/Ginger Stir-Fry recipes with your Gourmet Grater! Stainless steel and dishwasher safe.